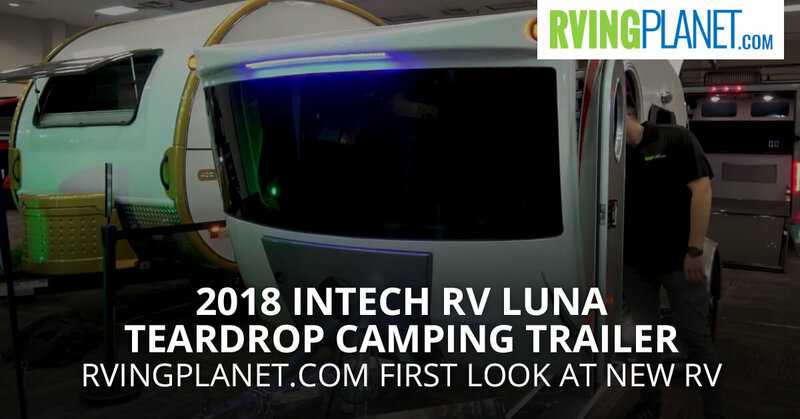 View All inTech RV Luna Teardrop Camping Trailer Floorplans! Nate: Hi, this is Nate without RVing Planet. Nate: And we’re here to show you the new Luna by inTech. All right, Rich. So I see this beautiful Luna right here with this awesome window. What makes the Luna, this new brand unique? Rich: Well, as you pointed out the front glass windshield, tempered glass windshield is the biggest thing. But what we really like about this is it gives you that million-dollar view. You unhook from your tow vehicle and you aim this at the lake and you get that million-dollar view that you normally got to buy a big home to do. And it’s a it’s a small camper no question about it, but what’s beautiful about it is it doesn’t feel small inside at all. It’s really got some room. Four people can sit in this very comfortably, two people up to 6’5″ can sleep in it, 40-inch television inside. It’s got a standard RV air conditioner with a heat pump. So it’s really built at a level above what most of the small campers are that you’re going to find out there. Nate: Kind of describe who would enjoy this RV the most, like it’s maybe an active adventurer? Rich: Not so much the active adventure, because you’re going to find that more with our flyer line. But this is going to be somebody who’s just looking for quick getaways, they’re going to be somebody that’s probably anywhere from forty to sixty years old. They probably have camped or RVed before but they’re looking for something that will fit in their garage if they want to, and they can get away quickly. Nate: Where’s Lunas spot, what makes it super unique? Rich: Well, it’s going to be the profile of it. When you look at traditional teardrop shows they’re going to curve down in the front. This isn’t. It’s curved and it’s still aerodynamic, but we’re utilizing this space a lot better than what most traditional teardrop trailers are. It’s a little bit different in its construction too. It’s not a steel frame. This is an all aluminum cage frame, so it’s really built to last a lifetime. It’s lightweight and extremely durable. Nate: What are your top three favorite features? Rich: Well, starting at the back it’s going to be the kitchen, because it’s truly a gourmet style kitchen. It’s got a three burner LP stove, a stainless steel microwave, a really nice refrigerator 12 volt 120, deep freezes even if you’re sitting in the middle of Death Valley. The thing’s incredible and there’s lots of room to move around and cook. Inside – the space, it’s just got more room than you can imagine. You’re not going to feel confined. When we first looked into this thing we started talking to people on teardrop trailers and they said they don’t like the confinement feeling. So we eliminated that. You can actually sit up in this thing and you’re comfortable. And then third and we’ve talked about already it’s going to be this front end. It’s just amazing. It’s absolutely beautiful, very automotive. Nate: Thanks for watching. If you want to check out the Luna by inTech you can head over to rvingplanet.com.